President Obama signs VA reform legislation at Fort Belvoir. 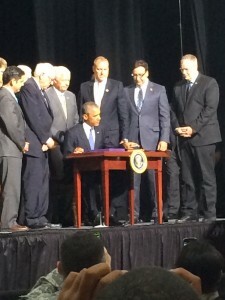 President Obama has signed into law sweeping legislation to reform VA. VetsFirst attended the historic bill signing on August 7 at Fort Belvoir, along with members of leading national veterans service organizations and locally stationed U.S. Army soldiers. The new $16 billion law is designed to give quicker access to health care to veterans who have been waiting long periods of time to see a doctor. The signature provision of the law allocates $10 billion to assist veterans who are on long wait lists or who live in remote areas with access to non-VA health care providers. To expand VA’s workforce capacity, the law provides $5 billion to allow VA to hire more doctors, nurses, and other medical and mental health professionals. The law also provides strict accountability reform, enabling the VA Secretary to much more swiftly fire senior VA executives who cover up waiting times or engage in misconduct. Another provision in the law that VetsFirst advocated strongly for is a 3-year extension to a brain injury rehab program for veterans. Without congressional action, the program would have expired in September of this year. This provision is one of many that will go a long way in assisting our veterans returning home after coping with injuries and illnesses. VetsFirst is pleased to see swift action on this bipartisan bill. The disturbing issues that came to light in VA’s health care system illustrate the need for strong and continuous congressional oversight. The veterans community, including VetsFirst, will also expect newly confirmed VA Secretary Bob McDonald to aggressively manage his senior management until trust is restored.